Gaddafi's Son: Last Gasp of Libya's Dying Regime? 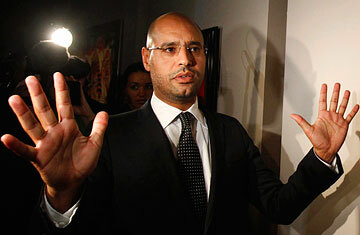 Can Gaddafi's Son Reform Libya? After the bloodiest few days in Libya's modern history  in which over 200 people are estimated to have been killed in clashes with security forces  the son of the country's leader Muammar Gaddafi told Libyans on state-run television that "rivers of blood" would flow with "thousands" of deaths if the uprising does not stop. At the same time, he promised a dialogue on new political freedoms and even a new constitution  the most drastic reforms Libya would undertake since Gaddafi seized power 41 years ago. "There is a plot against Libya," said the maverick leader's second son, Saif al-Islam, long regarded as Gaddafi's heir apparent, speaking after midnight, against a white backdrop showing an abstract map of the region. "The story is very dangerous," he said, wearing a suit and tie  a conscious break from his father's iconic tribal robes. "It is bigger than the Libyans and the young people in the streets, who are trying to imitate Tunisia and Egypt." Despite a rambling speech of about 40 minutes, Saif did not explain the most urgent question gripping Libyans late on Sunday night: Where is Gaddafi himself? Rumors swirled around Tripoli late Sunday that Gaddafi  whose titles are Brotherly Leader and Guide of the Revolution  might have fled the capital, if not the country, as eastern Libya descended into chaos and massacres. Gaddafi was last seen riding atop a truck in Tripoli on Friday during rallies to support him, in which crowds appeared to celebrate his leadership with posters and chants. Appearing alone, Saif seemed to be speaking on behalf of Libya's government, although he himself has no official role in it. The second son of the autocratic colonel who has ruled the country for more than four decades, Saif has been seen as the reformist hope of the country, in contrast to his brother Mutassim, Libya's national security adviser. But the speech he gave indicated that he was defending the dynasty's claim as the only guarantor of Libya's future and prosperity, hardly the fount of democracy he seemed to embody in an interview with TIME a year ago. Meanwhile, the cracks in the regime are mounting. Libya's permanent representative to the Arab League as well as its ambassador to New Delhi both quit yesterday, according to news reports. While Saif's talk was tough, his speech was unscripted and unfocused, which some might interpret as a sign of great strain. The diplomatic-corps defections as well as the speech may also represent Saif's attempt to win a far more intimate battle  the struggle for succession of his father's rule, against his brother Mutassim, a key player in the security crackdown against the protests. "Saif al-Islam is likely seizing the opportunity to leverage himself in this power struggle," said the private intelligence company Stratfor in a written analysis after the late-night speech. With an almost total news blackout, and cell-phone and Internet connections severely disrupted, video uploads and text messages over the weekend reported spectacular clashes in Libya's second biggest city Benghazi and several other cities in eastern Libya, including large-scale massacres in Benghazi and al-Baida on Sunday, some during funeral processions for those shot by snipers and regular security forces. Human-rights groups, battling to patch together the gruesome details from shaky telephone connections to hospital doctors and eyewitnesses, estimated the death toll at 233 as of Monday morning. And while the streets were reportedly quiet on Monday, protesters were celebrating in the streets of Benghazi, as they claimed control of Libya's second biggest city. As for Tripoli, schools, government offices and most shops were closed. Until now, the violence has been largely contained to an area about 600 miles east of Tripoli. But late on Sunday night, the turmoil seemed to touch the heart of the capital itself  a gracious Mediterranean city where the InterContinental, Starwood Four Points and Marriott chains have all recently built large seaside hotels. After midnight on Sunday, a resident in one of Tripoli's upscale neighborhoods scribbled a message online saying that "thousand [people] with machetes and guns" were on his street, "looting, storming houses. We have barracked [sic] ourselves in our house." Shortly after, he signed off, saying "can't talk, not safe outside." Others reported hearing gunfire in Tripoli overnight to outside news organizations by phone. Saif's speech mentioned no turmoil in the capital. Instead, he conceded that the heavy casualties in Benghazi and elsewhere were partly owed to "mistakes from the army"  presumably referring to units opening fire on unarmed demonstrators when the protests began last Tuesday. That remark was about the only concession he made, however. Instead, he warned that soldiers would have no reluctance to fire on demonstrators  a fact clearly demonstrated during the past few days  in contrast to the militaries' behavior in Tunisia and Egypt during the uprisings there during the past six weeks. "The army now will have a fundamental role in imposing security and bringing normality into the country," he said. "We will destroy all these elements of sedition. We will not give up any inch of the Libyan territory." Last night's speech was not only a critical point in trying to stanch a nascent revolt against Libya's repressive regime. It was a turning point for Saif himself. Ever since the U.S. reached a détente with Libya in 2003 and lifted sanctions in 2005, Saif has acted as an assurance for the future, for oil companies who have plowed billions of dollars into the country during the past six years, even though he officially has no political title. In interviews with oil executives, all say that Saif is the person whom they would most like to see running Libya. He has made occasional appearances at the World Economic Forum. And during two visits to Libya, I've seen countless corporate executives from the U.S. and Europe line up for appointments with Saif. For his part, Saif has stressed for years the need to end Libya's state-run institutions and open up its closed economy to foreign investment. He oversaw the creation of a new National Economic Development Board, whose head is Mahmud Gebril, an economist with a doctorate from the University of Pittsburgh. Another close Saif ally is the oil chief Shokri Ghanem, a former Prime Minister who lived for years in Vienna as an OPEC official and speaks flawless English. When government hard-liners tried to unseat the reformist Ghanem in 2009, Saif simply reinstalled him  no questions asked. It was, said one oil executive, a huge relief. Urbane and cosmopolitan  he lives much of the time in London  Saif is also wily and ambitious. In 2009 and 2010 he pushed to have the country's so-called General People's Congress  an unelected body that meets to pass laws  discuss a new constitution, but finally retreated on the issue, apparently having lost out to hard-liners in the government. When I interviewed Saif in February last year at his home, set amid an orange grove in Tripoli, he said he firmly believed that almost all Libyans wanted total political freedoms, and he displayed open impatience with those who were blocking change, while stopping short of questioning his father's rule. When I asked what level of freedom he would like to see in Libya, he said, "I'm talking about the level of freedom like in Holland. We want those changes now, not in 10 or 15 years' time." He added, "In black Africa we see real democracy, real elections, real parliaments, real constitutions. Why don't we have the same as them?" Many protesters in Libya say they too want democracy and open elections, and, indeed, Saif last night promised a General People's Congress discussion on forging a constitution for Libya. Yet he showed no readiness to tolerate political dissent  and insisted that the current turmoil was the work of foreign instigators and Islamic separatists. In an interview in Tripoli last February, Ghanem, the oil chief, said there "cannot be real economic reform without political reform." Saif made it clear on Sunday night that neither reform would occur without bloodshed.